The longer the list of ingredients, the more surprises we can expect. This is what happens when it comes to the 60-second hair balm from Goldwell. Its list of components is long and does not encourage us to buy it. The producer has developed Intra Lipid Complex 60 seconds treatment which effectively balances the lipid levels inside the hair and on the surface to instantly restore smoothness, suppleness and shine. Unfortunately, most plant extracts and natural substances take the first places on the list. 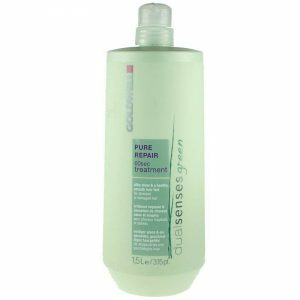 What is more, Goldwell Dualsenses Green Pure Repair comprises a majority of preservatives, waxes, and artificial substances which have comedogenic effects. However, the product does not consist of any sulfates, artificial colours, flavours, oils and parabens. All in all, the composition could have been a bit shorter which would have a positive influence on the quality of the formula. Use: Apply on clean, towel-dried hair, perform a short scalp massage, after a minute (60 seconds) rinse thoroughly. Purpose: Severely stressed, dry and damaged hair types. 60-second regeneration sounds really good, however, it does not mean an instant improvement in hair condition. This fast treatment is rather a marketing trick. When it comes to the regeneration and restoration of hair, it is visible only after the first two weeks of use. The effects right after the first use of Pure Repair 60 seconds Treatment are: better hydration, smoothness, radiance, improved combing and facilitate styling. Hair balm from Goldwell deserves praise for handy packaging and very pleasant, refreshing scent.